Inappropriate self-treatment with topically applied therapeutic or non- therapeutic agents frequently results in mucosal burns. This is a report of a rare and unusual case of an oral chemical burn caused by crushed raw garlic, and highlight the importance of early recognition, obtaining a detailed clinical history, and proper patient education to prevent future mucosal injury from inappropriate self-treatment. A 49 year old middle Eastern man sought dental care with chief symptom of maxillary right tooth pain. That man had 30 pack a year history of smoking. On that day the patient localized the pain to the maxillary right posterior molar region. Second molars ( teeth nos. 3 and 2, respectively ) were the offending teeth. He reported experiencing more intense pain in association with tooth no 3 than with tooth no 2. He also reported taking acetaminophen for the pain , which provided some relief. Stretching the patient’s buccal mucosa too see the vestibular disturbed areas of ulceration resulted in bleeding. The Palatal mucosa in the area of the maxillary right molars exhibited no erythema or necrosis, and the right side of the soft palate and tonsillar pillar showed no evidence of soft- tissue changes. On the basis of clinical history and the apperence of the lesions, the doctor suspected a chemical burn, and also considered other conditions in the differential carcinoma, or an infectious process, such as deep fungal infection. A doctor recommended an incisional biopsy for definitive diagnosis. However , the patient did not have medical insurance and refused an incisional biopsy and subsequent microscopic examination on the basis of financial concerns. On more detailed questioning , the patient admitted to placing crushed raw garlic in the vestibule in the area of dental pain throughtout the day while working as a construction worker. The patient’s family members has told him about the supposed analgesic effects of raw garlic, an inexpensive way to relieve pain after he used up his supply of acetaminophen. The doctor rendered a diagnosis of chemical burn of the oral mucosa from application of crushed raw garlic. Both teeth ( nos 2 and 3) exibited symptomatic irreversible pulpitis, sensitivity to percussion, severe gingival recession, and class II mobility. 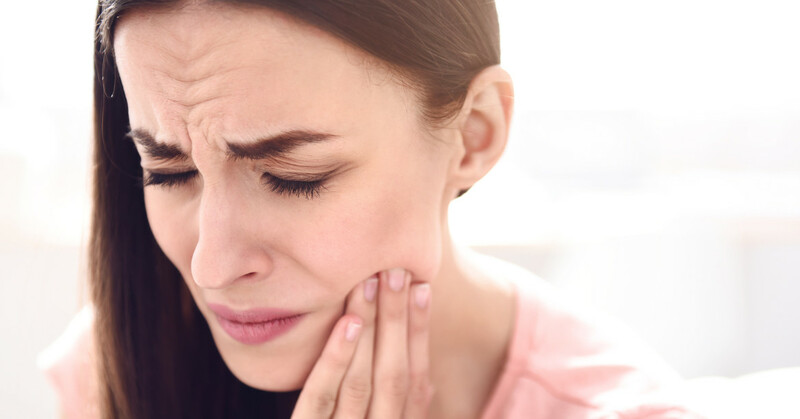 The doctor instructed the patient to discontinue the placement of crushed raw garlic in his vestibule to alleviate tooth pain because of its harmful effect on the oral soft tissues. doctor advised him that no additional treatment was indicated given that the soft tissue lesions were asymptomatic. Because of financial restrictions, tha patient opted to have 1 tooth extracted. Despite the convenience of obtaining a tissue sample at the time of the extraction, the patient refused an incisional biopsy. The department of oral and maxillofacial surgery performed a simple extraction of the tooth no. 3 , a doctor instructed the patient to return for extraction of tooth no. 2 and the residual roots of tooth no.1 and to complete the proper healing of the oral chemical burn,the patient has not returned for re-evaluation and was lost to follow up. therefore,we could not confirm complete and proper healing in this case. Chemical damage to oral mucosa depends on variety of factors such as the alkalinity or acidity of the material, its concentration , the quantity applied , the manner and duration of tissue contact , the extent of penetration into the tissue , and the mechanism of action. In general, the more caustic the agent and the longer the exposure, the greater likelihood and extent of tissue damage. Garlic also has antifungal , antiparasitic, antiviral , antimicrobial , antihypersensitive, blood glucose-lowering, antithrombotic , antimutagenic, and antiplatelet properties, expaining its continued naturopathic use. Given that a variety of chemical substances can cause tissue injury , general dentists should be mindful when examining patients with mucosal burns. Patient education is important in these caes and cessation of the behavior should be sufficient in treating chemical burns related to inappropriate use of medications or another agent. Most chemical burns are characterized by moderate tissue damage that heals spontaneously within 7 to 15 days without scarring. Because of the asymptomatic nature of the chemical burn in the case we present , no therapy was indicated. A doctor advised the patient to discontinue use of the offending agent and to be re evaluated for appropriate healing on returning for extractions of the remaing maxillary right molars. A rare example of an oral chemical burn caused by application of crushed raw garlic to oral mucosal tissue. Naturopathic use of garlic has been repored , and the patient in this case admitted to placing raw garlic on oral tissues in an attempt to relieve dental pain. Although such lesions can look worrisome typically no treatment is required beyond education of the patient, discontinuation of the behavior. 1. Gilvetti c,porter SR, fedele s. Traumatic chemical oral ulceration: a case report and review of the literature .Br Dent J, 2010 (7) 297-300. 2. Neville BW ,douglas DD, Allen CM,chi AC Oral and Maxillofacial pathology ,4th ed. st louis, MO Elsevier 2016:264-266. 10. Rebeiro AC Simonato LE.Santo-silva AR, de Moraes NP, soubhia AM Formalin burn Br Dent J. 2010;209(1):4. 13.Dietz DM, Varcelotti JR, Stahlfeld KR Garlic burns; a not so rare complication of a naturopathic remedy ?? Burns.2001;30 (6) 612-613. 17.Raffat M Leung AK Garlic burn pediatr dermatol 2000;17 (6) 475-476. 21. Arreola R, quintero -fabian s, Lopez Roa RI immunomodulation and anti-inflammatory effects of garlic compound. Immunol Res 2015;2015: 401630. 22.Nantz MP ,Rowe CA, Muller CE Creasy RA. Stanika JM> percival SS supplementation with aged garlic extracts improves both NK and Yo T cell function and reduces the severity of cold and flu symptoms; a randomized , double blind , placebo-controlled nutrition intervention. Clin nutr 2012;31(3) 337-344. 23. Bagga s, Thomas BS,Bhat M .garlic burn as self inclined mucosal injury : a case report and a review of thr literature . Quintessence Int 2008;39(6) 491-494. 24. Bayan L. Koulivand PH , Gorji A. Garlic a review of potential therapeutic effects. Avicenna J Phytomed 2014;4(1)1-14.